When it comes to the refurbishing of a white metal bearing shell, it is very difficult to achieve the required original manufacturers tolerances. This is due to the form, position, straightness and parallel measurements that must all be extremely accurate to avoid an imbalance in the machine. The manufacturing tolerances used by RENK for it's products are extremely accurate and are nearly impossible to duplicate after the bearing has been manufactured. Problems therefore with the rotor dynamics can lead to vibration, high temperature issues and ultimately machine failure. 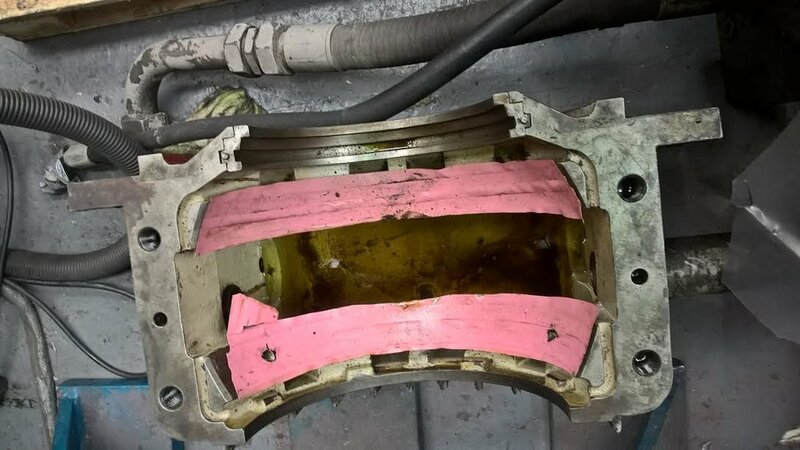 When the white metal is damaged on an original bearing shell and replacement material is added to attempt a repair, there are potential issues with the binding of the new and old material. This will compromise the quality and lifetime of the bearing shell. Additional complications include standards, approvals, warranties, and guarantees which should also be considered if components are refurbished and later result in a failure at site and any consequential damage to your machine. Refurbishment of white metal bearing shells can also be a timely process and in some cases create long-term shutdowns. Many of our bearing shells are available straight from stock and can be shipped next day, so we can greatly reduce downtime in the event of an emergency. Please also remember that if you have an issue with a bearing shell, it should not simply be changed or refurbished. The reason why damage has occurred should be explored and understood to prevent a repeat of the problem, which is also something RBK can assist you with.